The other day I was driving on a major highway and noticed a billboard on my right. 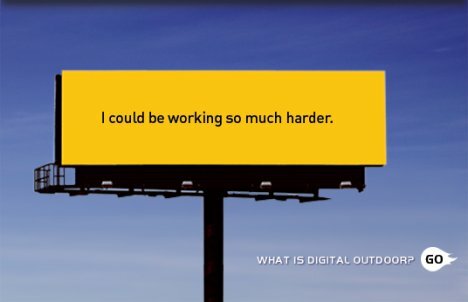 I don’t slow down for billboards, unless I’m planning on being the accident of the day, but this one made me laugh. I decided to get off at the exit and make a second pass at it. The billboard was simple: lots of white space and a one-line address; no city name, just a street number. As I whizzed past the billboard and the exit I thought, “Where is 700 Central Avenue?” I know my way around, but I don’t think about the business numbers as I drive the highway. Is it more of a women’s thing? Would a man automatically know the address? I was wondering what it was near and where should I exit. By the way if you Google “700 Central Avenue” it brings up about a dozen addresses in different states. The number is meaningless to me; maybe it’s just me . I remember places by locations and landmarks not by numbers. To check out my theory, I reached in my book case for a copy of what I call my “gender marketing bible.” The book is called, Why Men Don’t Listen and Women Can’t Read Maps by Allan and Barbara Pease. If you’re interested in gender differences, Barbara and Allan Pease are the best and the funniest. According to the book, I was on the right track; women are more likely to find places by their locations rather than their addresses. For instance, “next to Marshals on Central Avenue” makes more sense than 700 Central Avenue. Having both of the above is even better. How about including the city name so I can put it in my GPS tracking system? This prompted me to research billboards in general. What are the tips for building an effective billboard? I have never researched billboards and know very little about them. 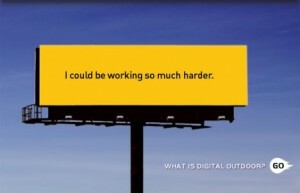 This article, Ads on Your Digital Billboard: You Are Your Customers’ Salesman, Not an Artist had three tips that seem very useful. Advertising messages should be created for, and directed at, the Heavy Using Customers in your category. I would think in this case women although men seem to be doing lots of the supermarket shopping. Women make (almost all of) the financial decisions and they buy (almost) everything—commercial as well as consumer goods. That doesn’t seem surprising. People over 50 comprise 29% of the population and they control 77% of financial assets (and they are the target for 10% of all advertising!!!) It’s interesting that more advertising dollars aren’t spent on the over 50 crowd; I was beginning to think it was personal. A billboard is a way to market your customer service. Directions to your business are part of customer service, and not everyone thinks the same way. I thought maybe the billboard was a teaser; it was so exciting that everyone will get to the exit and go back and read it again—I wonder. In order to get known a business has to market itself and its customer service to the target consumer. Customer service is a prevailing attitude that permeates the company—it is “the company” and defines your business. If businesses defined it this way, they wouldn’t be cryptic about their directions. Maybe I don’t have a sense of humor. I know I don’t have much time to shop or do anything other than work. How about his; “We just came to town and to find us get off at the next exit, exit 5. You’ll find us at 700 Central Avenue. Oh and by the way, when I get to the intersection do I turn right or left? Lisbeth Calandrino helps businesses build loyal relationships with their target customers through customer service seminars. To have her speak at your next event, call 518.495.5380. Was that billboard in northern New England? It reminded me of that old Yankee shopkeeper who, when asked for directions to his store, replied: it’s the fifth building BEFORE the post office. That is a riot, thanks Dan.